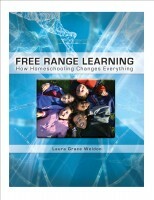 Steve Hargadon: Tonight - Laura Grace Weldon on "Free Range Learning"
Tonight - Laura Grace Weldon on "Free Range Learning"
Join me tonight, Thursday, February 7th, for a live and interactive FutureofEducation.com conversation with Laura Grace Weldon on her book Free Range Learning: How Homeschooling Changes Everything. I've long argued that the homeschool movement has for decades now intellectually explored a lot of the same territory that the ed tech movement explores through constructivist and social software, particularly self-directed learning and student agency. As my interview series has been weighted lately toward these topics, I can tell by some diminished attendance at particular events that there is still discomfort for some (many?) exploring homeschooling's pedagogical insights because of strong beliefs around compulsory universal schooling, because of concerns about the quality of the homeschool experience, and perhaps because there is less tangible, practical application of these discussions to day-to-day teaching expectations. However, I'm staying the course. I'm convinced that the larger cultural, business, and social shifts precipitated by the Internet are going to require more entrepreneurial, self-directing, and self-aware learning experiences. Student success today is largely a measure of having learned to meet others' expectations and to comply with institutionalized education, but as our students and children enter the changing worlds of work, civic responsibility, and cultural participation, these are likely to be less valuable and less personally-fulfilling traits. I believe, therefore, that including discussions about--and the awareness (and sometimes embracing) of--the lessons from the homeschool community are a critical part of building teaching and learning opportunities that match the challenges and opportunities of our time. Studies indicate that adults who were homeschooled are: * More likely to vote, volunteer and be involved in their communities than graduates of conventional schools. * Read more books than average. * More likely to have taken college level courses than the population as a whole. * Tend to be independent and self-reliant.... Children are naturally "free range" learners, she says. They build knowledge and skills naturally, within the full spectrum of their daily lives, while observing, exploring and pursuing their interests. Mightybell: A Mightybell space with interview resources and conversation is at https://mightybell.com/spaces/22394#. Okay - my black board is loaded but I can't log in - is that because it's not "live" yet? The room typically opens up 30 - 60 minutes before the show. See you soon! I am a teacher in a public school system but I have had relatives and friends who have home schooled their kids and I give this merit. The one major thing I want to say about homeschooling is that the teacher doesn't have the same discipline issues. I would imagine they have some but as a classroom teacher, I can say that we waste a lot of time on discipline. Imagine if we could get all the students to get their assignments done, participate in class, do not upset the class, and learn with hands on projects? !